Hi Dandi Crafters! Today I have an extra freebie for you. 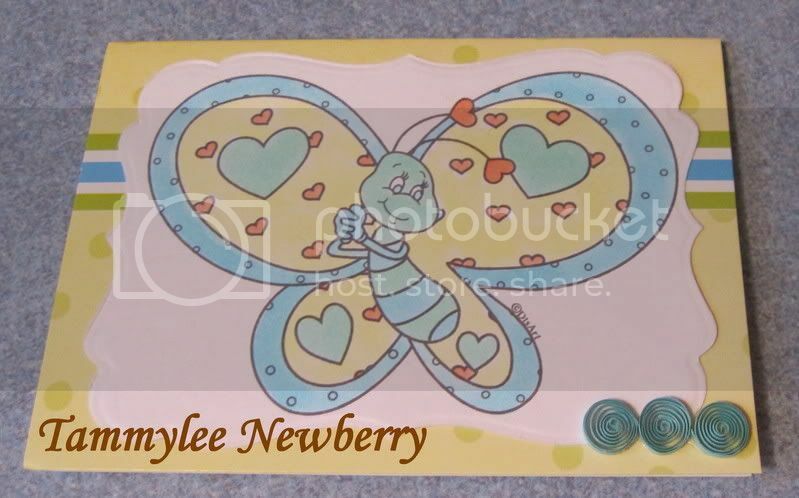 A free butterfly digital stamp. Thanks to everyone that clicked the top 100 digital sites button. I hope you will continue to click that button for me! I am also happy to announce my digital stamp design team. Hi Dandi Crafters! 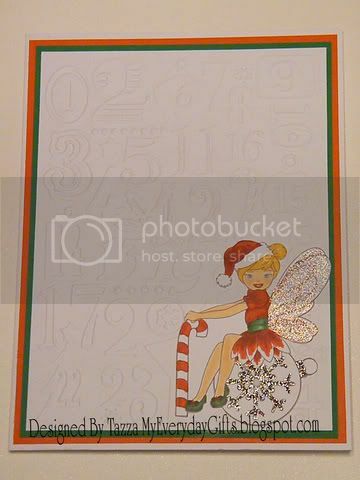 Newly added to my online store and ready for all your Christmas Holiday project is Christmas 2010 Lila May Fairy Digital Stamp. Lila May is ready the holidays holding a candy cane while sitting on a Christmas bulb sporting a Christmas hat. The Design Team made some cute projects to inspire. My design team is made up of the follwing talented ladies. Hi Dandi Crafters! This week over at the MyGrafico Challenge Blog today's challenge is, "to bling it up". 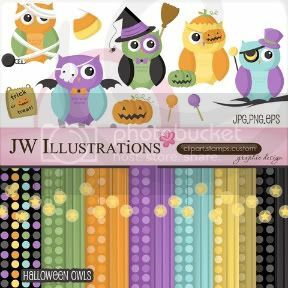 The Design Team members and I got to use the oh so cute Halloween Owls by JW Illustrations. Be sure to check out all the designers at MyGrafico. 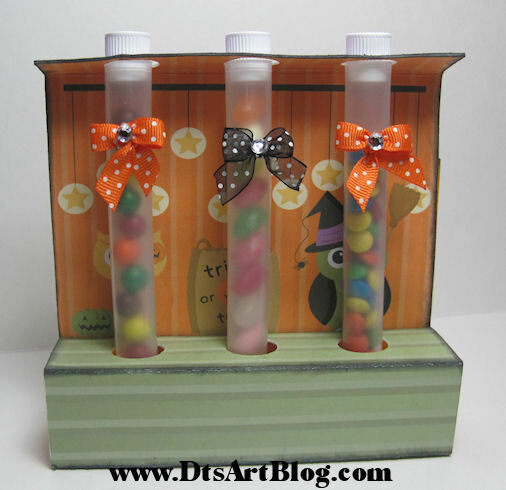 I decided to make a test tube holder. it came out pretty cute. It was more of a hybrid project. I designed a test tube holder and then cut it out with my SCAL enabled Cricut. I think it came out pretty cute. Whata think? Hi Dandi Crafters. I just wanted to say thank you. A week ago I posted this message. 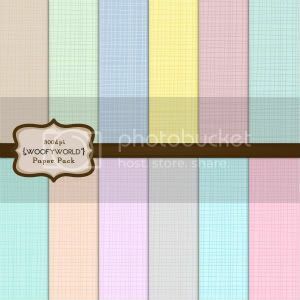 "Hi Dandi Crafters! 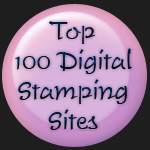 Before we get to today's Take Out Tuesday, I would appreciate it if you took sometime out of your busy day and looked to the right side of the blog toward the top, see the Top 100 Digital Stamping Sites button. If you could take a moment and click it. I would be every so thankful. When the clicks going in says 100 I will put up a freebie." I reached 100 clicks and appreciate everyone that took the time to click for me. 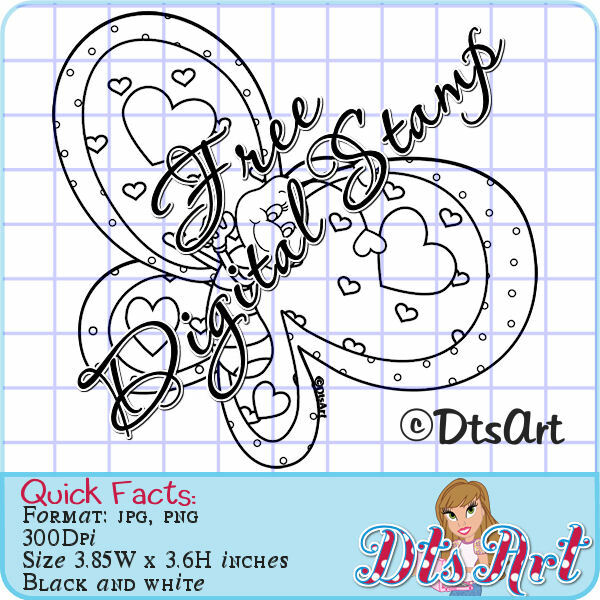 Come back on Thursday I will post a free digital stamp for you to download. Until then be sure to scroll down to the previous post to download this weeks Tuesday's Take Out, candy corn. Thanks so much for all your clicks. Hi Dandi Crafters! Today we have one last Halloween file for you, Candy Corn. It is too cute, comes in classic look or ric rac look. It has just 2 layers but the second layer has 3 pieces to it. The candy corn as it is shown here is just about 5 inches tall. The file was saved in SCAL 1 so it can be used in SCAL 2 also. The SVG file is also included so you can use Make the Cut. I cut the decorative layer 3 times, each time in a different color. Take Out is provided as a thank you for my followers, available for download on Tuesdays and Wednesdays. On Thursday we throw out the left overs. MyGrafico Challenge No # 71: Have A Egg-cellent Day! Hi Dandi Crafters! 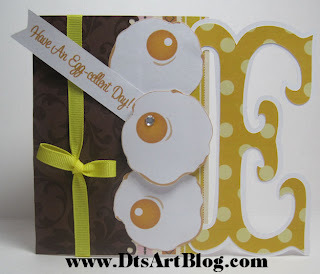 This week over at the MyGrafico Challenge Blog today's challenge is, " to emboss". 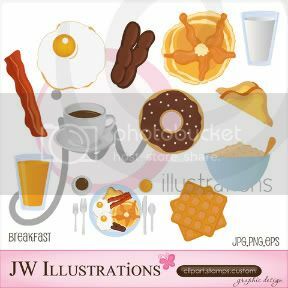 The Design Team members and I got to use Breakfast by JW Illustrations. 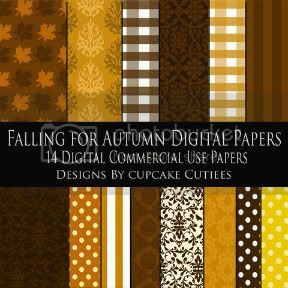 We also worked with Falling for Autumn Paper Pack by Cupcake Cuties. Be sure to check out all the designers at MyGrafico. I made a fun little card. 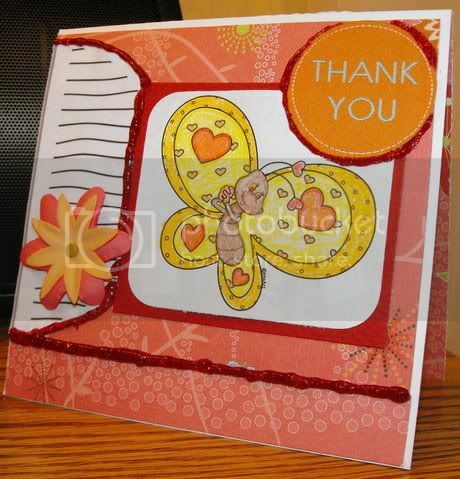 I used an A2 card that I had and covered it with the yummy Autumn Papers. I then added a yellow ribbon and 3 sunny side up eggs, one with bling. I printed out Have An Egg-cellent Day on my computer and used my SCAL enabled Cricut to cut out the pennant flag. 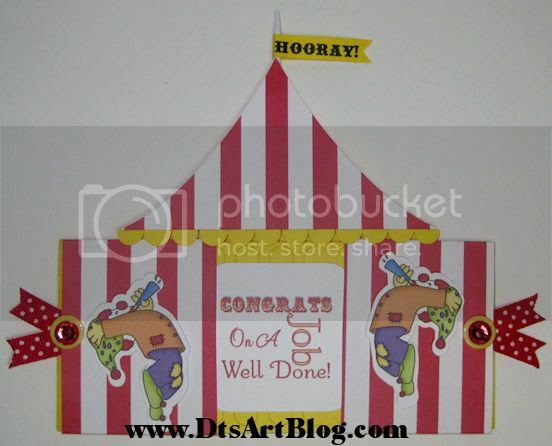 I used the Cricut Storybook Cartridge for the E. It is just a fun card. Hi Dandi Crafters! 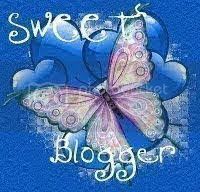 Before we get to today's Take Out Tuesday, I would appreicate it if you took sometime out of your busy day and looked to the right side of the blog torward the top, see the Top 100 Digital Stamping Sites button. If you could take a moment and click it. I would be every so thankful. When the clicks going in says 100 I will put up a freebie. Welcome back to another Take Out Tuesday. When you follow a blog you usually do so because over all you enjoy the blog, however there are times when check that blog and a post jumps out at you and you say,"YES!! This is EXACTLY why I follow this blog! ", you are happy, energized, and full of ideas. This is ONE OF THOSE POST. If you follow my blog and are here on Tuesday or Wednesday, you are HAPPY (and Thank you for following my blog), if you don't follow my blog and you have arrived on Thursday or later, you're going, "Ohh I am so bummed, this is so cute!" (you should sign up to follow my blog so you don't miss anymore Take Out Tuesdays). 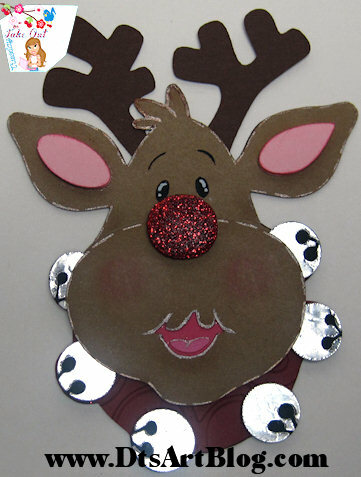 Either way let's get to today's Take Out Tuesday, a happy, Red Nose Reindeer. Now to discuss was is not there. There are no eyes. The eyes and brows are cut outs in the head. I placed a 1 inch circle behind the head to get black eyes. Then I highlighted with a white gel pen. There is no mouth, again I used a circle behind the snout which contains a mouth cut out. After I positioned the circle behind the snout I then glued the tongue to the circle in the mouth area. To get the look on my reindeer I used pop dots to raise the ears, bell bases, snout and nose. I used my glitter paste, which is discussed in this post, for the nose. I hope you enjoyed it. Take Out Tuesday is provided for my followers on Tuesdays and Wednesdays, on Thursday we throw out the left overs. 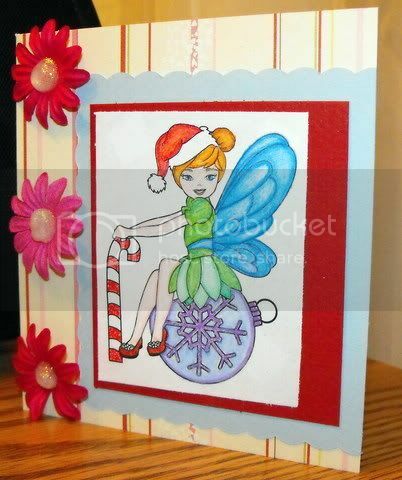 Hi Dandi Crafters, I have just added a new digital stamp to my online store, Christmas Mouse Waiting For Santa. This little sleeping mouse is so cute. No doubt he is exhausted having to carry that big candy cane to his tea cup bed to give to Santa as a present. 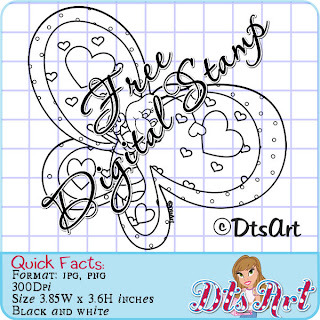 You are sure to have loads of fun coloring this digi stamp for all your crafts. 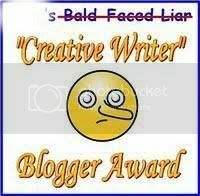 In order to properly receive this award I have to thank Jean (check, did that) and I have to pass it along to 5 fabulous blogs. I love all these blogs in no particular order. 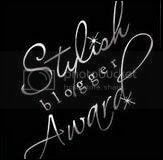 Pop over to all the blog and see why I think they are FAB! Hi Dandi Crafters! 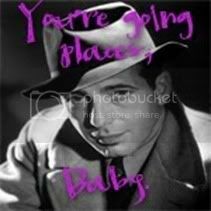 Over at the MyGrafico Challenge Blog today's challenge is, "Anything Goes". 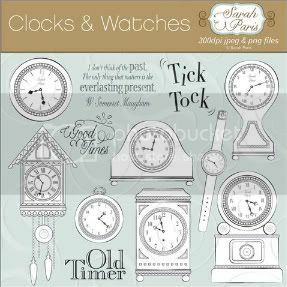 The Design Team members and I used Clocks and Watches by Sara Paris. 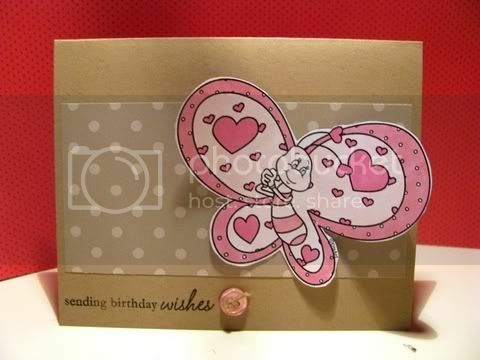 We also worked with Cross Hatched Paper by Woofy World. Be sure to check out all the designers at MyGrafico. 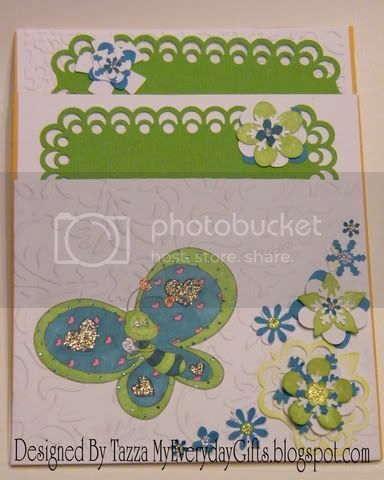 I found the theme of the digital stamps and papers really enjoyable use. Time is not a subject that I scrap about or even really think about as theme. However, it is the passing of time, to treasure a moment in time, that drives the whole scrapbooking industry. My husband and I have gone to Disney World throughout our entire relationship. It was one of the first trips we took together as a couple when we started dating. We got married at Disney World and honeymooned there. We went to Disney when I was pregnant with every single one of my 4 kids. and took each one back before they were 1 and have taken them pretty much every year since. Most people think of Disney World as timeless and never changing. I however think of Disney as a member of the family and see it much as I do my children and my marriage, forever changing and growing and developing through phases. One of my favorite things to do when we go to Disney World every year is look and see how the castle has changed. I have seen the castle with a lot of different looks, sort of like my boys with their hair cuts. 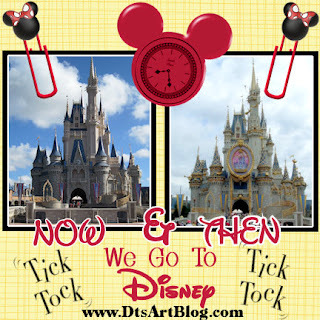 LOL That is why I did a layout of Cinderella's Castle as it appeared in July 2010 and in June of 2005. Hi Dandi Crafters! Thanks for stopping by for another Take Out Tuesday. 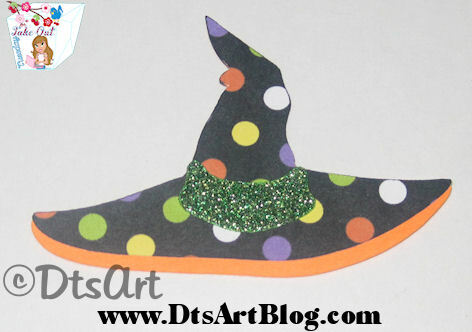 We have a fun little witch's hat today, super cute and easy to layer. You will have a great time using it to embellish all your spooky cute projects. If you follow me then you know that Take Out is provided for my regulars and followers to download on Tuesday and Wednesday. On Thursday we throw out the leftovers. If you are not a follower you may want to consider becoming one so you don't miss any more Tuesday Take Out. Hi Dandi Crafters! 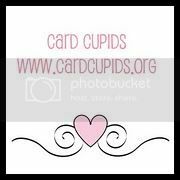 Here is a look at the new digital stamps on sale now for only $1.25 each on my website. This sale won't last long. The digital download for digital stamps is not working at the moment all digital stamps will be emailed to you within 24 hours. Puppy Love Lara cute little girl holding her pup. Cecilia Fairy The key to my heart. 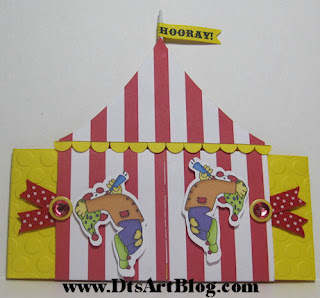 The Design Team members and I used Joyful Clowns Stamp by Delik Design Studio. We also worked with Circus Paper Pack by Cupcake Cuties. Be sure to check out all the designers at MyGrafico. A challenge, that is putting it mildly! Clowns and Circus that is not the type of challenge that would normally gravitate to. That is exactly why I like being a design team. I can stretch and grow and be challenged out of my comfort zone! "What the heck am I going to do for this challenge, probably an uninspiring card." Those were my first thoughts. After panic past I came up with a FANTASTIC idea. I honestly don't know how I came up with this idea. LOL it is like an ace crafter possessed me for this challenge. LOL. This idea wasn't scrap lifted. I am not saying that there isn't other cards out there similar to this one, there might be. I just haven't seen them that I can recall. Hi Dandi Crafters happy Take Out Tuesday to you! Today I have a juicy apple for you. It seems in the fall I always use a ton of apples, back to school, Halloween bop for apples, apple pie. I could go on. The way this apple was designed you can get a few different looks from it. The apples shown here are cut just over 4 inches tall. You will find the exact measurements along with term of use and copyright in the folder which contains SCAL native cut .scut and can be used in SCAL 1 or SCAL 2. You will also find the SVG format so if you use Make The Cut. The seeds are cut out with a brown circle behind it. I did not include the circle because I figured everyone can find a circle and many may want to use the actual seeds for even more versatility. 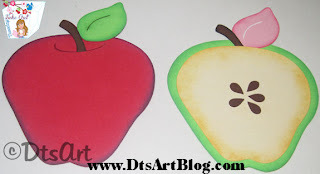 So there you have it today's Take Out Tuesday, one Apple several looks. As always thank you for following me. It is for you my regulars that I post Take Out Tuesday. Be sure to download it soon. Take Out Tuesdays are provided for my followers on Tuesdays and Wednesdays. On Thursday we throw out the leftovers. 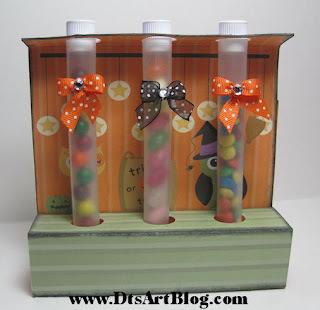 Hi Dandi Crafters, over at Sugar Sweet Paper Treats it is my turn to host the challenge and serve the winning guest blog candy. Make sure to pop over and show me some LOVE. LOL This months challenge is to make a notebook. Bind it, cinch it, alter it, post it, make it large or mini, it does matter just make a notebook. 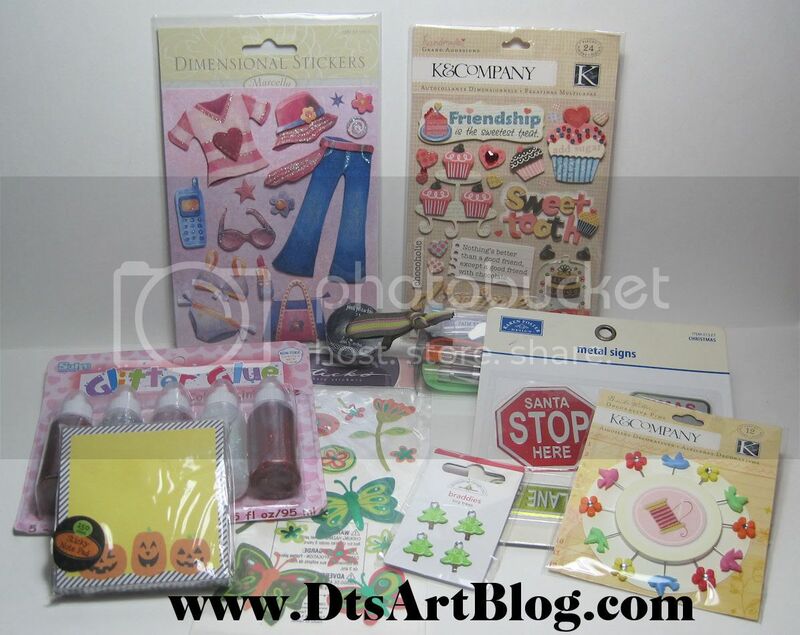 I am giving away the following blog candy. 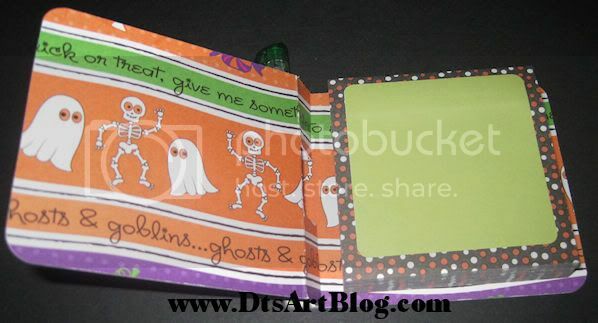 I made a cute little Halloween Post It Notebook. I love notebooks, altered, mini, composition books, whatever, I love them. This is very easy to make. I used a couple of pieces of Halloween paper. It came in a variety pack , 8 sheets for a $1.00 at Target. It was so generic it didn't even have a manufacturer's name on it. LOL But it was cute so, "hey, there are worse ways to spend a $1." LOL I glued the papers to either side of card stock to give the notebook some weight. I decorated the front with orange grosgrain ribbon. the scallop circle and cat are from Cricut Cartridge Create A Critter. The Cat is cute at 1.25 inches high and the the scallop circle is 1.50 inches. I inked the sides of the notebook with black ink and the scallop circle with orange ink. I used glitter paste on the bow tie and nose. The eyes are 2 tiny rhinestone, no bigger than a thought. 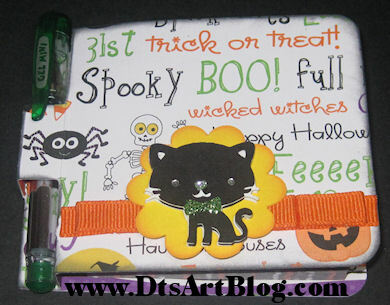 LOL I then added a Halloween themed post it notepad to inside. 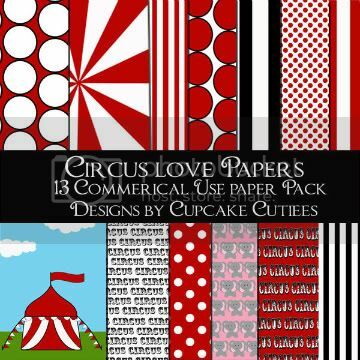 •cardstock, double sided is best but not required. •Cut card stock at 3.25 inches high by 8.5 inches long if you are going to round the corners as I did. •Cut 2 slits from the first score line of 4 to the third score line at 5 taking note to center the slits from the middle. 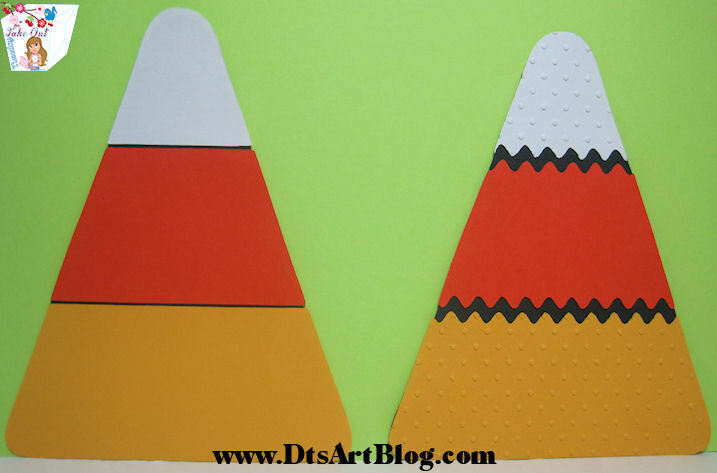 •Then fold mountain fold the first and last score line with the middle score being a valley. Glue the last mountain fold down to the back and pop out the slit middle so it forms a slot to hold your mini pen.